MSE associate professor John Cumings. The A. James Clark School of Engineering and the College of Computer, Mathematical, and Natural Sciences are pleased to announce that Department of Materials Science and Engineering (MSE) associate professor John Cumings will serve as interim director of the Maryland NanoCenter, effective July 1, 2015, while its current director, MSE professor Gary Rubloff, is on sabbatical for the Fall 2015 semester. 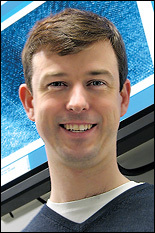 Cumings has been actively involved with the NanoCenter's Advanced Imaging and Microscopy Laboratory (AIMLab; formerly known as the Nanoscale Imaging, Spectroscopy, and Properties Laboratory [NISPLab]) through his work on real-time exploration of material properties at the nanoscale since his arrival at the University of Maryland in 2005. He has been involved in the acquisition and installation of some of the NanoCenter’s most important equipment, including an e-beam lithography tool, an electron energy loss filter, and a spectrometer for the center's field-emission transmission electron microscope (TEM); a high resolution JEOL 2100 LaB6 TEM; and most recently, two focused ion beam (FIB) instruments. He is a member of the UMD Nanostructures for Electrical Energy Storage Energy Frontier Research Center’s (NEES EFRC) “Self-Healing Nanostructures for Electrodes” research thrust. Cumings, who earned his Ph.D. in physics at the University of California at Berkeley in 2002, studies the dynamic properties of nanoscale systems. He and his group have routinely been recognized for their unusual discoveries at the nanoscale and the development of novel research techniques that made many of them possible. Among their notable accomplishments are the creation of a "pseudo ice" used to study the behavior of hydrogen atoms in real ice that seem to defy the Third Law of Thermodynamics; the invention of a technique called electron thermal microscopy, which allows real-time tests of nanoscale devices in situ; and the discovery of a phenomenon dubbed "remote Joule heating." He is the recipient of an NSF CAREER Award and the Clark School’s Junior Faculty Outstanding Research Award.